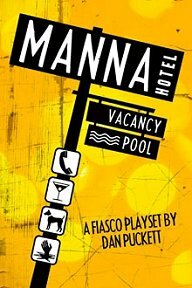 Publisher's blurb: "The Manna Hotel is three miles north of Manna, Kansas, population 1,200. A twenty-room motor lodge with its own in-ground swimming pool, now unused, the hotel burned down and was rebuilt in the fifties. Wood paneling and window-unit air conditioners were installed in the seventies, and it looks like that's the last maintenance anyone did to the place. "This tight playset focuses on the claustrophobic confines of a small, run-down Kansas hotel full of odd mysteries and desperation."